Get in, lie down and relax - after an active day on the slopes or in the huge hiking area, a sauna visit in our family hotel works as a balm for the soul. Of course you also pamper your body when relaxing in our spa with or without kids. In our family wellness hotel, the entire family can enjoy our brine steam bath at a comfortable 45°C. The high humidity of 90% additionally has a positive effect on skin and bronchial tubes of young and old. After the sauna session and relaxng with mum and dad, taking a shower in our funny quacking showers provides even more fun. The family sauna also invites the little ones to play and relax in our family wellness hotel. It’s great fun with the integrated bowl game and lots of other funny surprises. The temperature in this sauna is childproof as well: at 55°C it’s even pleasant for the youngest ones to warm here. After the sauna session you can relax on one of our comfortable deck chairs in the panorama garden of our family wellness hotel, while the children are playing on the spacious green area, or, in winter, you can enjoy the refreshing deep snow after a sauna visit. Enjoy wellness holiday with children in the Allgäu and book relaxing days in the Allgäuer Berghof. Experience a relaxing family wellness at the NEW Berghof. With a new Family-Spa for the whole family and a new MaPa-Spa only for parents. In your family hotel in Bavaria you can sweat in our new sauna world with an amazing view. Afterwards, you can cool down in the snow or in the wellness garden. Wonderful moments in togetherness. 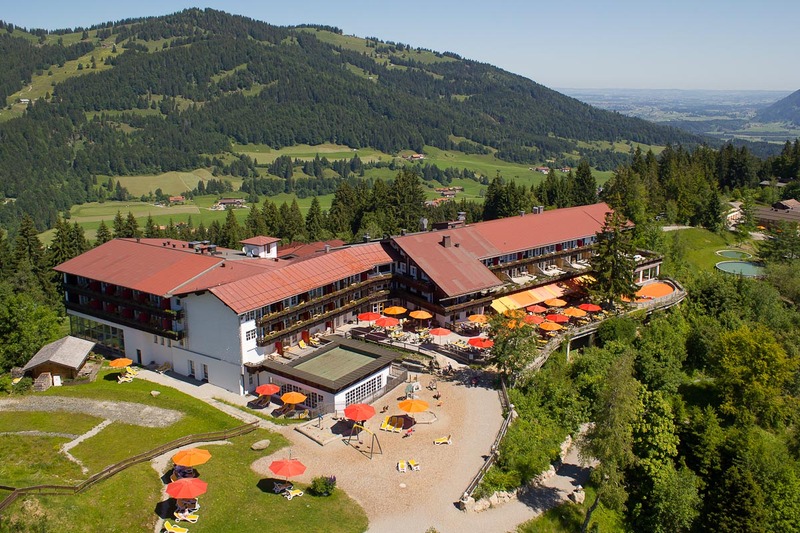 You can really pamper yourself during your holiday with child care in the Allgäuer Berghof. Exotic massages, smoothing peelings, cleansing facials or a manicure treatment offer pure relaxation. You can stay fit in your holiday with with child care: the modern gym an the daily training sessions with the sports coach make it possible. Our restaurant, the lounge with fireplace or the terrace provide you beautiful places in our children's hotel in the Allgäu. Our pampering all-inclusive concept offers culinary delight for every taste. Enjoy your meal in your family holiday in the Allgäu.